You may not have heard of them, but you’ve sat on their wares. Adient is a new independent company, formerly the automotive seating division of Johnson Controls. In their former guise, they made seats for just about every car manufacturer in the known universe. But they had to vie for resources under a parent company involved in fields as disparate as batteries and corporate real estate management. The seating division hired Futurebrand, a global branding agency in the Interpublic Group, to create its new independent identity. Futurebrand hired me to write the branding and tone-of voice style-guides for the new company. I worked with the strategy team, the account team, and the art directors to distill all of the branding ideas into a document that could be easily understood by both the client and its ad agencies. The style guide will be translated into over a dozen languages. Forge a relationship with the reader. 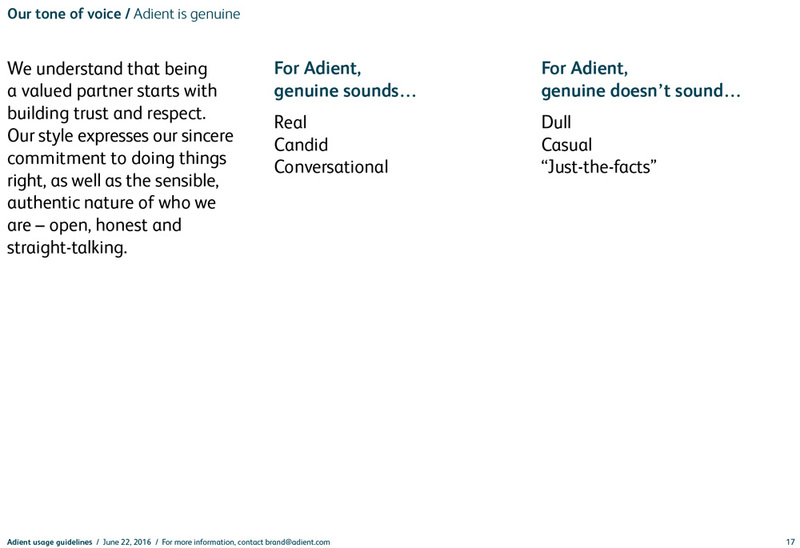 Adient may exist in a B2B space, but at the end of the day, we still communicate with real people…which is why it’s critical to create an authentic connection with our audience. Be personable with personal pronouns: When talking about ourselves, using “we” sounds more approachable than “Adient.” And addressing our audience as “you,” instead of “our customers,” feels warm, welcoming and direct. Encourage further interaction: Keep the conversation going by incorporating calls to action and invitations that further engage with readers. Elevate the benefit beyond a product truth. 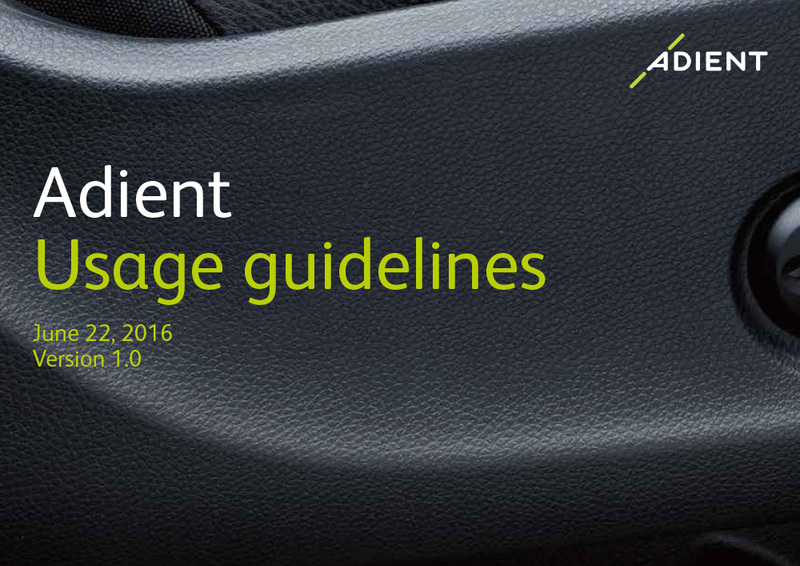 As an industry front-runner, it’s easy to talk about the things Adient does well. But to elevate ourselves above the competition, we have to make customers care by letting our products tell a bigger story. Make the physical emotional: Don’t be afraid to discuss the human advantages and sensorial experiences that end-consumers feel when using our products. Though consumers aren’t our main audience, themes like quality, comfort and craftsmanship are compelling to everyone. Embrace success stories: Along with our products, our superior service is a huge reason why customers choose Adient. Sharing real “precisely right” moments show we’re dependable. And legacy stories prove that our spin-off is still rooted in expertise – and only changing for the better. Speak as a citizen of the world. 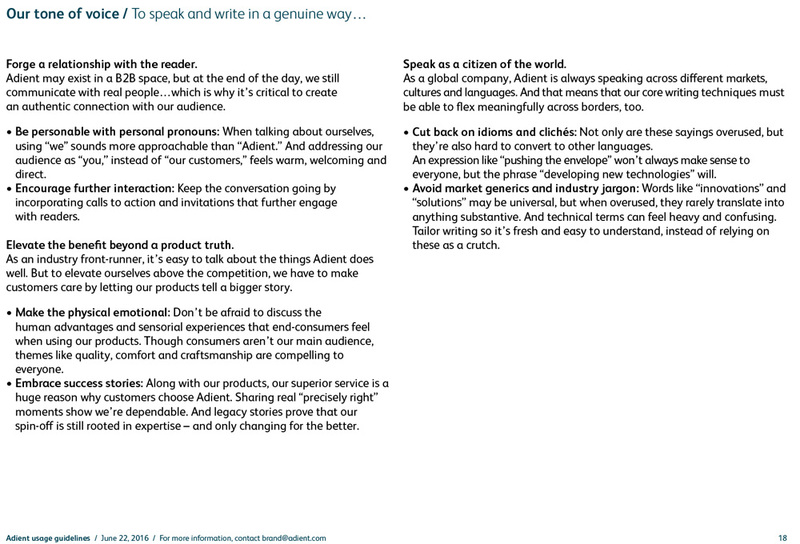 As a global company, Adient is always speaking across different markets, cultures and languages. And that means that our core writing techniques must be able to flex meaningfully across borders, too. Cut back on idioms and clichés: Not only are these sayings overused, but they’re also hard to convert to other languages. An expression like “pushing the envelope” won’t always make sense to everyone, but the phrase “developing new technologies” will. Avoid market generics and industry jargon: Words like “innovations” and “solutions” may be universal, but when overused, they rarely translate into anything substantive. And technical terms can feel heavy and confusing. Tailor writing so it’s fresh and easy to understand, instead of relying on these as a crutch. Our style expresses our sincere commitment to doing things right, as well as the sensible, authentic nature of who we are – open, honest and straight-talking.